It has been my privilege to work with a talented team of writers, editors and other assorted heroes on the Quakebook. 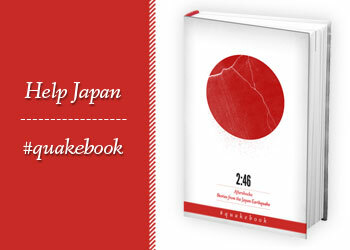 If you don’t know about the Quakebook yet, please go to the website and have a look and consider buying it. It’s a Twitter-sourced compilation of stories from people affected – emotionally or physically – by one of the worst natural disasters in history. As of today, it’s available via the Amazon Kindle and Sony e-reader. What’s exciting about the publication is that 100% of sales go directly to the Red Cross for earthquake/tsunami relief in Northern Japan. Amazon and Sony waived their normal percentages so the most money can go directly to the people who need it. 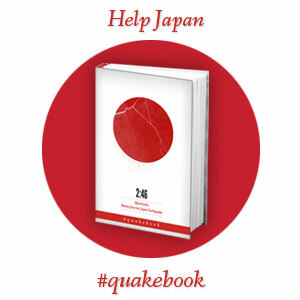 In other exciting news, Quakebook will be available very soon as a physical book and it will be bilingual, Japanese and English. It’s available for pre-order at Amazon Japan and I’ll circulate the exact publication date when it’s announced. Artists and writers such as Yoko Ono, Jake Adelstein, William Gibson have given pieces to the Quakebook, but that’s not the only reason to read it. The contributions to the book are heartfelt and real. Each one is beautiful and heart-wrenching at the same time. This is representative of the spirit of a people who will rebuild and return. It’s a testament not only to the way the Japanese feel about their country, but the way foreigners feel about – and fall in love with – Japan. Please help buy purchasing a copy – electronically now, and physically later. It’s a small price for a great gift. And as an extra bonus, spread the word. ← Oktoberfest. In May. In Tokyo. I didn’t know it was Twitter-sourced or bilingual. Thanks for the info!